Munich - The 2012/13 Bundesliga campaign has not been particularly kind to Baden-Württemberg thus far, with VfB Stuttgart, 1899 Hoffenheim and SC Freiburg all languishing at the wrong end of the standings going into Matchday 3. The latter two sides both have the chance to belatedly kick-start their season this afternoon however when they meet at Freiburg's MAGE SOLAR Stadion. As it stands, the south-western state's three Bundesliga clubs currently occupy three of the bottom six places in the table. Freiburg started the 2012/13 season with a 1-1 draw at home to 1. FSV Mainz 05. That was followed by a 2-0 defeat at home to Bayer 04 Leverkusen, a result which set a negative tone for the campaign. Freiburg's coach Christian Streich is therefore hoping it will be a case of third time lucky when Hoffenheim come to town. "We got a few tactical things wrong at Leverkusen and that is why we had no chance there," he said. "We have worked energetically and with engagement to deal with that and get it right tactically so that we get stuck in and get into the game quickly." Despite the gloom, though, Freiburg do have an admirable record of not having lost any of their last nine home games, including the last eight from the previous campaign. "But that record interests me very little," cut short Streich. "Of course we don't like to lose and that is the only reason why we should not do so on Sunday." Not, then, purely for the case of statistics. 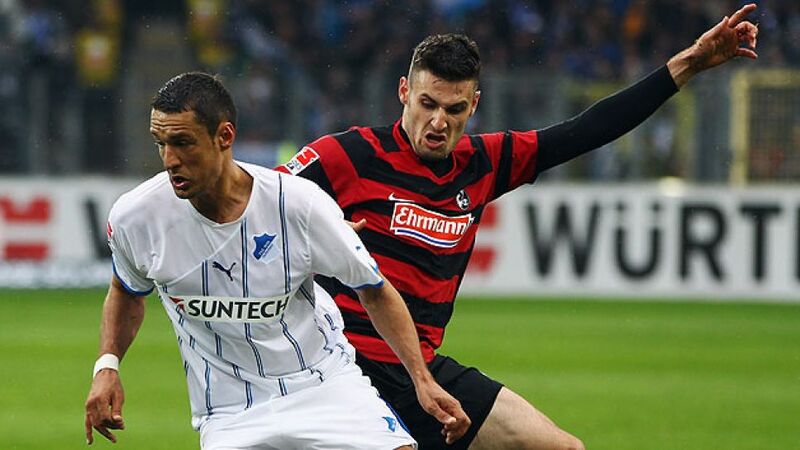 Hoffenheim have won only one of their previous seven games against Freiburg - a statistic which needs as much improvement as their start to the season with three straight defeats, including the first round of the DFB Cup. Coach Markus Babbel will be given enough time to put things right, though. "I am fully behind Markus Babbel because we don't see any reason to blame the coach when we are looking for reasons for our results," said the club's owner Dietmar Hopp to Radio Regenbogen. "We will keep our calm and that will pay off." Babbel may not show the same level of patience with his players, though, and after three negative results changes can be expected. One change is an enforced one with Sejad Salihovic suspended while Chris is ruled out with thigh injury. Andreas Beck is available again, though, and could play, as could Patrick Ochs. "Both have trained well and there is a strong battle for places," said Babbel. "I will make my decision over which of the two starts at the last minute."